Ministry of Propaganda - 24/Dec/2006: "A Modern Family"
This morning I went for a nice walk with my father, stopping at the Haus am Walde for a pint (well, a beer, they don't have pints here) on the way. Some father and son talk on the way. For lunch we had Kohl und Pinkel and we're going to eat at Der Spieker on Boxing Day. Now we're having more food, walnuts, meringue biscuits and other. While my father is having his afternoon nap the rest of the family is pretending to be a modern family. 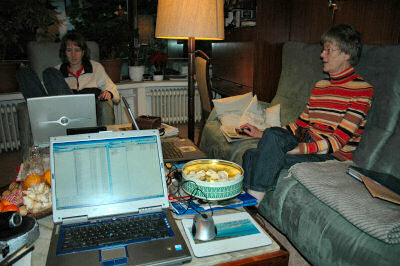 Yes, there are three laptops on the table, my sisters (back left), my mothers (right) and mine (front). All wirelessly connected to the internet, surfing the web, sending e-mails with pictures and the like. But no, we're still talking to each other directly, not through a chat. Frohe Weihnachten! Merry Christmas! If I get a chance I'll post the "official" Christmas photo of the Grewe family later today or tomorrow.